Thebans has the makings of a modern classic. Julian Anderson’s much anticipated first opera, which received its world première at English National Opera on Saturday, is both epic and restrained, traditional and cutting-edge, hard-hitting and subtle. It is a very promising start to what ENO says will be a series of new British operas to be premièred over the next two years. Music director Ed Gardner commissioned an opera from Anderson, one of the country’s most celebrated younger composers, as long ago as 2006. Bravely, Anderson turned to some of the most famous plays ever written: Sophocles's Oedipus Rex, Oedipus at Colonus and Antigone, which together make the Theban trilogy. Even more bravely, he decided — with the help of the Irish poet and playwright Frank McGuinness, who wrote the libretto — to condense all three plays into one three-act work. The result is unusually pacey for an opera. Act One rattles through the famous Oedipus myth, in which the eponymous king discovers he has unknowingly killed his father and married his mother. Act Two jumps to the end of the trilogy, showing Oedipus’s daughter Antigone defy Creon, Thebes's new ruler, as he tries to stop her burying her outcast brother. Act Three then tells the story of the blind Oedipus’s death at Colonus, a sacred wood near Athens. Such a succinct treatment of this hugely dramatic tale — the opera lasts about an hour and forty minutes — doesn't leave much time to flesh out the characters, but the action never flags. McGuinness has whittled Sophocles's plays down to a succession of very short, simple lines that can be easily heard when sung across an auditorium. Anderson’s music fills the emotional space around these lines. It is very fluid in the first and third acts: harmonies, instrumental sounds and rhythms are forever shifting, flowing into and over each other. This effect is intensified through extensive use of microtones — the tones between the notes of the conventional Western scale. There is an acute attention to instrumentation and the detail of sounds, particularly in the Act Three depiction of the wood. The second act is different: Creon’s police state is conjured up with music of militaristic regularity, quite unusual for Anderson. The singing is top-notch throughout. Roland Wood as Oedipus showed little sign that he was overcoming a cold, as announced before the performance. Susan Bickley made a terrifying Jocasta (Oedipus’s wife and mother); her spikily lyrical exit aria, in particular, is hair-raising. 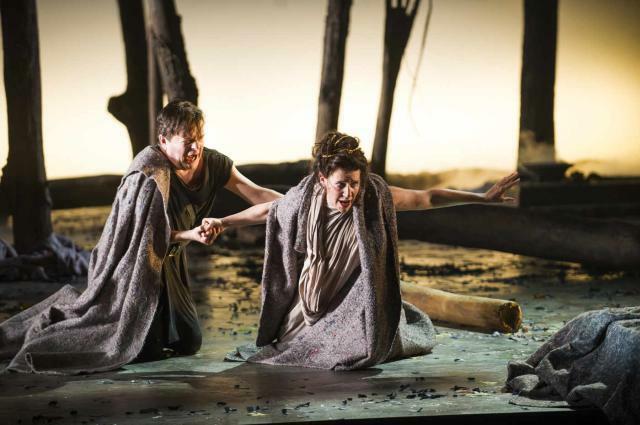 Matthew Best as the blind prophet Tiresias, Julia Sporsen as Antigone and Christopher Ainslie as the messenger share the best of the rest of the solo music. But perhaps most powerful of all is the chorus, which sings its extensive and ferociously difficult part with utter conviction. Anderson’s music is not easy to grasp with the mind’s hands. There are no tunes; it does not tell us when to be happy, sad or afraid; the end does not sound like an end. But the sound-world he so meticulously crafts is a kaleidoscopic marvel of colours and musical comments, always engaging, sometimes gripping, never clichéd. For all the antiquity of its roots, Thebans may point to the future of opera. Thebans, with music by Julian Anderson to a libretto by Frank McGuinness, is playing at English National Opera, at the Coliseum, St Martin's Lane WC2, until 3 June. Tickets £10 - £60. We saw this production on a complimentary press ticket.